Easy to install, roll-out vinyl and self-adhesive vinyl TV studio floors. 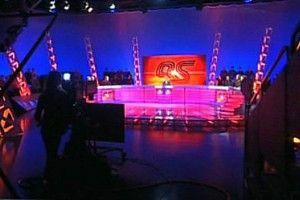 From X Factor to The Nobel Peace Prize, our floors have been used by some of the largest TV studios in the world. With fast on-demand deliveries and a wide range of stocked colours, Le Mark’s TV Studio Floors have been the No.1 name in TV and film set design for over 25 years. All our floors have zero drying time unlike most paints, this gives studios and set designer the ability to completely change a set floor with minimal turnaround time. StudioTak™ is a self-adhesive instant tv studio floor which has been specifically designed and manufactured for the TV, Film and studio market. 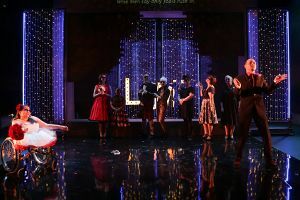 Set designers love that it is easy to use and visually stunning. Simply remove the backing liner and apply to give an outstanding smooth finish. The beautiful Harmony™ High-Gloss is a single sided portable tv studio floor and has been at the centre of high gloss TV game shows for many years. Combined with our special high gloss StudioTak tape it can be easily joined almost invisibly. Harmony™ High-Gloss is specifically designed to offer you that finishing touch and offers a platform to enhance every aspect of your production. Sonata™ Studio is a professional, single sided rolled-out TV studio floor. 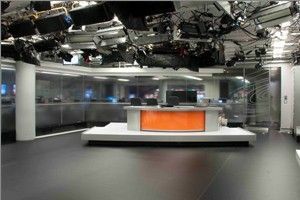 Sonata Studio offers a beautiful satin matt textured finish, making it ideal for working with professional lighting and has also been adopted into the HD TV studio floor market. Sonata™ Studio is a heavier floor ideally suited for permanent installation however the inner mineral fibre layer provides excellent dimensional stability, allowing the dance floor to be easily laid out and rolled-up for transportation or storage for touring performances.